ASHLAND — Galion High School’s jazz band will be among those performing next week at Ashland University’s award-winning, 40th annual Maplerock Jazz Festival on Friday, March 22. 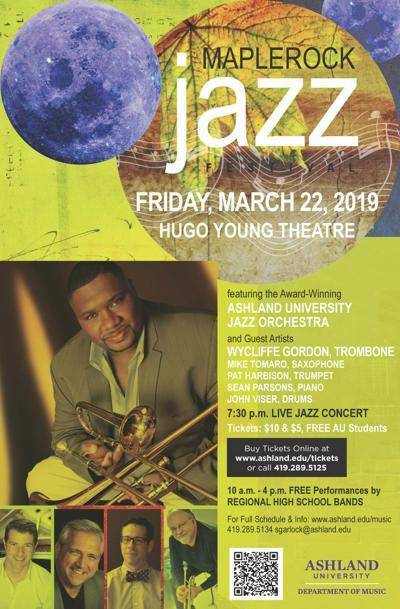 Along with free performances by 10 area school jazz ensembles from 11:30 a.m. to 4:30 p.m., the event a concert at 7:30 p.m. in Hugo Young Theatre that features five professional jazz artists. The Jazz Festival’s evening concert will open with the Ashland University Jazz Orchestra under the direction of Dr. Scott Garlock. The concert program will headline guest jazz artists: Wycliffe Gordon (trombone), Mike Tomaro (sax), Pat Harbison (trumpet), Sean Parsons (piano) and John Viser (drums). 11:30 a.m. — Foundation Academy of Mansfield Jazz Band; Noon — Rittman High School Jazz Band; 12:30 p.m. — Crestview High School Jazz Band; 1 p.m. — Crestwood High School Jazz Band; 1:30 p.m. — Bloom Carroll High School Jazz Band; 2 p.m. — Ashland High School Jazz Band B; 2:30 p.m. — Brunswick High School Jazz Band; 3 p.m. — Stow-Munroe Falls High School Jazz Band; 3:30 p.m. — Galion High School Jazz Band; 4 p.m. — Ashland High School Jazz Band A. The afternoon performances are free and open to the public while tickets for the evening concert are available through the Ashland University Box Office at 419-289-5125, from noon to 6 p.m. weekdays, or online at www.ashland.edu/tickets. Tickets cost $10 for adults; $5 for senior citizens, non-Ashland University students and Ashland University faculty and staff; and are free for Ashland University students. For more information about the Maplerock Jazz Festival or the Ashland University Jazz program, visit www.ashland.edu/music.